Anheuser-Busch InBev has petitioned the White House to give everyone a day off on Major League Baseball's Opening Day. Even if it doesn't work, the beer maker is reaching the right audience. Update (3/31/2014): The White House issued a statement on the petition to make baseball's Opening Day a national holiday, but threw the issue over to Congress -- which has the authority to make that happen. PORTLAND, Ore. (TheStreet) -- So Anheuser-Busch and St. Louis Cardinals Hall of Famer Ozzie Smith got more than 102,000 signatures on their White House petition to make baseball's Opening Day a national holiday. Just the merciful end of a sad marketing ploy by a flailing multinational brewer, right? Anheuser-Bush InBev throws a whole lot of money at sporting events and spent more than $150 million on the Super Bowl alone since 2009, according to Nielsen. Of the more than $450 million that Nielsen says A-B spends on U.S. television ads, 65% of it goes toward spots that run during sporting events. But the $40 million per year that it reportedly pays Major League Baseball to serve as its official beer sponsor through 2018 -- plus the individual beer partnership deals it's inked with more than 20 MLB teams -- are about to pay off big. The all-too-common refrain we've heard about Anheuser-Busch InBev in the years following the economic crisis was that the Brazil/Belgium-based beer behemoth was slipping. A-B's production was down an estimated 0.7% last year after falling for much of the past decade, but A-B still holds a roughly 46% share of the U.S. market by volume. While the Brewers Association craft beer industry group is right to point out that its brewers' beers are now 8% of the market by volume and 14% in dollars, the declining popularity of A-B's Budweiser, Bud Light and Busch brands has been as much about economy as it is about light lager's popularity. Despite shifting tastes that have brought imports and homegrown styles such as the IPA to the fore and forced A-B to buy the Modelo, Goose Island and Blue Point breweries, 18% of all beer consumed in the U.S. is Bud Light. Bud Light's foes now just cost more. Lower-tier brands including Pabst Blue Ribbon, Busch and SABMiller's Miller High Life sell for an average of $15 a case, while flagships such as Bud Light and Coors Light bring in around $20 for those 24 bottles or cans. That same case of imported beer fetches closer to $30, while craft beer averages about $33. The Beer Institute, a beer industry organization based in Washington, points out that import and craft gains came at the cost of overall industry losses. The Beer Institute compared unemployment rates with average monthly beer shipments during the same period and found that overall shipments began decreasing steadily in 2009 and continued through June 2012 in direct correspondence with job numbers. While big brewers have been trying to plug the leaks by offering craft-style beers and even hard ciders, they're getting back to basics and going after their traditional premium and economy beer drinkers. With good reason. The $6 billion a year spent by lower-end beer drinkers is nearly a fifth of the $31 billion U.S. beer market, according to Nielsen. By volume, it's more like 25%. So what does A-B know about those drinkers? They're older, they're male, they don't make a whole lot of money, but they spend a whole lot of it on beer. According to Nielsen, the average economy-beer drinker spentt $252 last year on beer and made 18 trips to the store to get it. That's not only more than anyone else, but far more than the $169 spent on 11 trips to the store for the average craft drinker. Oh, and there's one other thing: They fall into roughly the same demographic as baseball fans. During last year's World Series, Nielsen said the average viewer was 54.4 years old. That's up from 44.8 in 1991 and is more than 16 years older than the median age of the U.S. population at large. As with big beer brewers, critics cite that aging fan base as baseball's biggest drawback. It, they say, is the reason that the World Series' biggest audience has collapsed from the 55 million who watched Game 7 in 1986 World to the 18 million that watched last year's deciding Game 6. That argument is similarly flawed. For one, the more than 74 million people who attended games last year was the sixth-highest total of all time (though 1.1% lower than 2012, thanks to 37 weather-related postponements). Average attendance of 30,514 is nearly 10,000 more than it was 30 years ago and higher than it was even 10 years ago. Tales of baseball's demise have been overstated a bit, but its thriving older fanbase is just fine by Budweiser. As it turns out, more than 91% of baseball's audience is 21 or older, according to Nielsen. That's a higher percentage than the National Football League or National Hockey League (89% apiece) and far more than the National Basketball Association (83%). While it could be argued that each of those leagues has a better farm system for fans than baseball's, none are more capable of bringing Bud back its coveted base of old-school beer drinkers -- and none of them will get the White House on the line to do so. 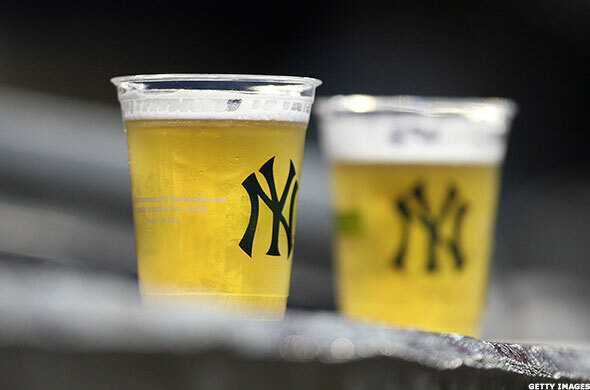 "We're working with them to accelerate that so we can get a quicker response," Tom Kraus, director of Budweiser Brand Marketing at Anheuser-Busch InBev, told MLB.com. "Once we get a quicker notification, we will share that info with our Facebook friends and all the folks who have been engaged in this movement with us. Then from there, we are working on specific market activations to bring this to life and thank the community and the White House for hopefully making this an official holiday." Mmm, "market activations." That means that now that the White House has made a relay throw over to Congress, which has the authority to make an Opening Day holiday a reality, A-B can get fans in local markets to make a Budweiser-branded plea to their local representative. That kind of smooth talking and marketing jargon might send bored younger folks running for the nearest smartphone screen, but to older, cheap-beer-swilling baseball fans, it's as soothing as the crack of the bat and the roar of the crowd.